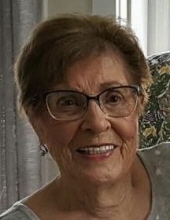 Sally Jane (Toperzer) Bova, 83, of Stow, formerly of Littleton died Thursday January 30, 2019 in Boston. She was the beloved wife of 22 years of the late Daniel J. Bova who died in 1978. Born in Medford on February 25, 1935 she was the daughter of the late Frank M. and Pauline Agnes (Marshall) Toperzer. She was a graduate of Medford High School and Salem State Teachers College. Mrs. Bova was formerly employed in the Guidance Department at the Peabody and Sanborn Middle Schools in Concord. She later worked as an administrator at Acorn Structures in Acton, Millipore in Bedford, and Banyon Systems in Westborough. A resident of Stow since 2001, she was an avid Boston sports fan, enjoyed reading, playing piano, boating on Lake Winnipeusaukee, camping at Plum Island and her cat Allie. She especially enjoyed spending time with her family and friends. She was the devoted mother of Denise Bova and her partner Mark Gruskowski of Littleton, Janice Kreidermacher and her husband Bill of Stow, Sharon Baczkowski of Leominster, Laurie Levesque and her husband Tony of Maynard, and loving grandmother of Meghan and Nicole Kreidermacher , Dave and Nick Baczkowski, and Brandon and Devyn Levesque. She is also survived by 2 sisters in law Dianne Smith and her husband Randy of Dennis, Linda Bova of Plymouth, and by her nieces Christine Wilson, Andrea Bateman,and Susan Semle and nephews Michael Toperzer, Dean Smith and Dennis Bova. Visiting hours will be held on Tuesday February 5th from 4 to 8 pm at the Dee Funeral Home, 27 Bedford Street, Concord Center. Funeral will be held on Wednesday February 6th from the Dee Funeral Home beginning at 9:45 am followed by a procession to Woodlawn Cemetery, Concord Road, Acton for a graveside service at 11 am. Funeral will be held on Wednesday February 6th from the Dee Funeral Home beginning at 9:45 am followed by a procession to Woodlawn Cemetery, Concord Road, Acton for a graveside service at 11 am. "Email Address" would like to share the life celebration of Sally J. Bova. Click on the "link" to go to share a favorite memory or leave a condolence message for the family.